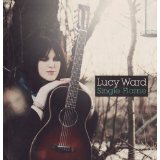 When Lucy Ward name-checks Melanie Safka and Bob Dylan in the opening track of her brooding, portentous album Single Flame, she is giving notice of the high standards she has set herself as a singer/songwriter – and signalling to her listener that the voyage they’re embarking on won’t always be comfortable. It is testament to her skill that as she leads them into ever darker and murkier waters, the lyrics underpin her swirling, haunting melodies like seams of black diamonds, redolent with hard truths and acerbic observations, and she never compromises her intentions. From “I Cannot Say I Will Not Speak” onwards, Ward proves she is right up there with artists like Ange Hardy, and Kathryn Roberts and Sean Lakeman, who have brought a new kind of gritty realism to modern British folk music, utterly contemporary – and often devastating – in their themes of protest and injustice but equally true to the rich heritage of traditional story-telling. There is a doom-laden quality to many of her songs that is never less than satisfying and is often bleakly tender, not least in the album’s masterpiece, “The Last Pirouette”. Here, the fading beauty of a washed-up prima ballerina becomes a metaphor for the end of the world. By rights, it should put you on your own suicide watch. Instead, it soars in exhilarating three-time, echoing in the vaults of the ceiling like a universal dance of death. Other songs cover similarly traumatic terrain: “The Consequence” explores the chilling, seeping imprint left by domestic violence; “For the Dead Men” is a multi-layered exploration of the relationship between campaigners, the victims of injustice and the bystanders who do nothing – all dead, either in the cause or morally, through their inaction; “Rites of Man” is a shimmering eulogy to nature, the ultimate casualty of human folly. Indeed, folly – of humanity, of war, or of the individual (check out “Icarus”, a sorry tale of desertion) – is one of Ward’s grandest themes. As we mark the centenary of the outbreak of the Great War, numbers like “Shellback” (Ward’s first composition) and the upbeat “Marching Through the Green Grass” (an adaptation of an Appalachian folk song) assume a heart-catching resonance. But if all this sounds forbiddingly apocalyptic, the depth and beauty of the writing also generates shafts of hope that pierce the blackness. “Velvet Sky” is an anthemic explosion of colour and optimism. With producer and occasional co-writer Stu Hanna, Ward has created the glorious, almost symphonic equivalent of a diorama in which characters spring to life and move against the backdrop of her assured musicality. This is an auspicious piece of work, which reveals more depth and nuance with each play.